In 1924, University of Chicago students Nathan Leopold and Richard Loeb were young, rich, and looking for a thrill. The crime that came next–the brutal, cold-blood murder of 14-year-old Bobby Franks–would come to captivate the country and unfold into what many dubbed the crime of the century. As the decades passed, the mythology surrounding the unlikely killers continued to capture the interest of new generations, spawning numerous books, fictionalizations, and dramatizations. 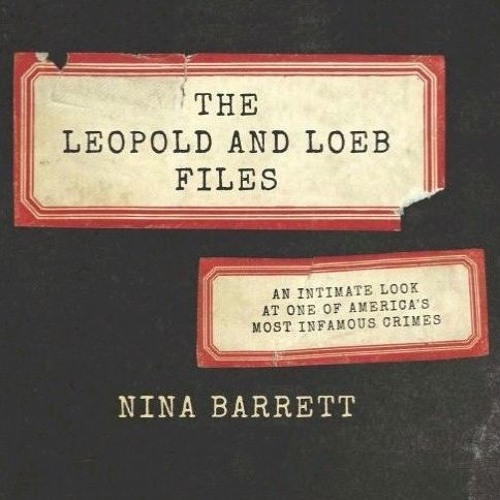 In The Leopold and Loeb Files, author Nina Barrett returns to the primary sources–confessions, interrogation transcripts, psychological reports, and more–the kind of rare, pre-computer court documents that were usually destroyed as a matter of course. Until now, these documents have not been part of the murder’s central narrative. This first-of-its-kind approach allows readers to view the case through a keyhole and look past all of the stories that have been spun in the last 90 years to focus on the heart of the crime. Nina Barrett, a graduate of both Yale University and the Medill School of Journalism at Northwestern University, is the author of three books and numerous articles, essays, and reviews. Her work has appeared in the New York Times, the Chicago Tribune, and The Nation, among other places. In 2009, she curated an exhibition for Northwestern called The Murder That Wouldn’t Die, which inspired The Leopold and Loeb Files. Barrett is also the founder and owner of Bookends & Beginnings, an independent bookstore in Evanston, Illinois.. Books will be for sale, cash or check. Recorded at the Highland Park Public Library on October 25, 2018.